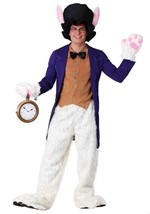 We carry the largest selection of adult Alice in Wonderland Halloween costumes. Find adult Alice in Wonderland costumes like Alice, the Mad Hatter, Queen of Hearts, King of Hearts, the White Rabbit, Cheshire Cat, Tweedledee and Tweedledum. Go to your next theme or Halloween party in style in one of these amazing costumes from the famous movie!